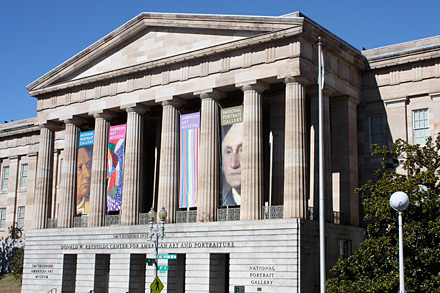 Experience America’s past and present at the National Portrait Gallery, also known as the Donald W. Reynolds Center for American Art and Portraiture. This branch of the Smithsonian investigates American history through the people–from presidents to artists to athletes–who molded it. 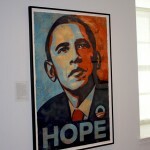 Portraits range from traditional paintings of presidents to bronze sculptures to pop art. 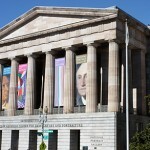 American Presidents, one of the gallery’s most esteemed exhibitions, is the only full collection of presidential portraits outside the White House. Starting with Gilbert Stuart’s prized “Lansdowne” portrait of George Washington and ending with the now famous red, white, and blue painting of Barack Obama, the collection is exceptionally diverse. 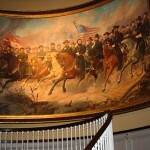 Special attention is paid to Presidents George Washington, Andrew Jackson, Abraham Lincoln, Theodore Roosevelt, and Franklin D. Roosevelt for the significant impact of their times in office. 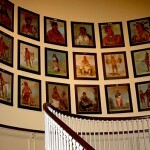 Other permanent collections include American Origins, which uses portraiture to track the American journey from the first contacts between American Indians and Europeans through the Gilded Age. Next comes 20th Century Americans, showcasing major cultural, scientific, and political figures of the past 100 years. Jo Davidson: Biographer in Bronze is made up of 14 portraits in bronze and terracotta created by the renowned sculptor. Champions explores famous athletes who had an impact on America outside the realm of sports, and Bravo is a tribute to performers—from P.T. Barnum to Marilyn Monroe—who contributed considerably to American popular culture. The Portrait Gallery also houses many temporary exhibitions. 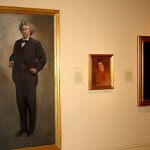 Check the gallery’s web site at www.npg.si.edu for current information. Hungry? Stop by the Courtyard Café for casual dining in the Robert and Arlene Kogod Courtyard, notable for its undulating glass roof. The Café menu includes soups, salads, sandwiches, and antipasti selections. Menu items are available until 4 p.m. The Café also offers “Grab & Go” premade sandwiches and salads until 6:30 p.m. Wi-Fi is available throughout the Kogod Courtyard. 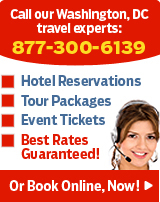 Hours: Open 11:30 a.m. to 7 p.m. daily. Closed Christmas Day. Parking: The nearest private garage is one block west of the museum, at 9th and F Streets. Metrorail: Red Line and Yellow and Green Line to Gallery Place/Chinatown.